Enjoy sit down ocean and Catalina views from the living room, bedroom, kitchen and deck. 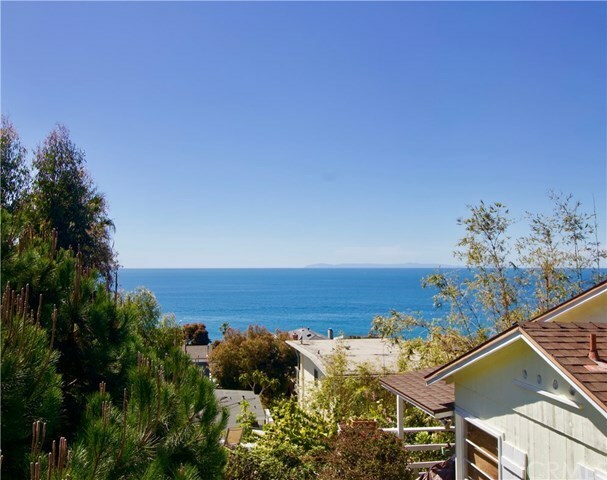 This updated beach close home provides the relaxing and sought after South Laguna Beach lifestyle. Just a short walk to the world class Thousand Steps Beach. Open and bright this recently updated home features beamed ceilings, stainless steel appliances, hardwood flooring, dual pane windows, mirrored closet, custom lighting and a spacious deck off the bedroom to soak in the sun. Lower level accesses the 2nd bedroom, spacious studio or guest suite with a full bath, kitchenette, and mirrored closet the private entry makes for a great rental. Situated on a corner lot with a landscaped yard, privacy hedge, rose garden, patio, outdoor lighting & parking for several cars. Ready to enjoy the Laguna Beach lifestyle, this home has it all and can serve as your primary residence, great second home or vacation rental.